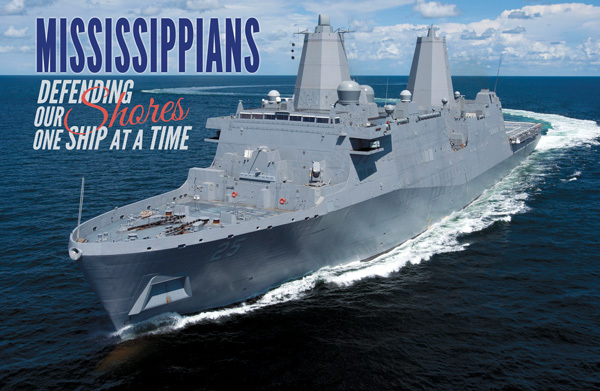 Ingalls has called Mississippi home since 1938. In that time, the company has merged and spun off, taking on names such as Litton and Northrop. The thing that has remained constant is shipbuilding. 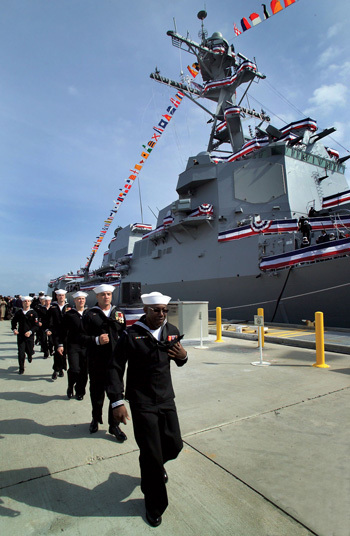 In 2011, Ingalls returned to the Ingalls name, as the Ingalls Shipbuilding division of Huntington Ingalls Industries, and today they are producing some of the most advanced ships in the world for our armed forces. Ingalls is one of the world’s largest shipyards and produces nearly 70% of the Navy’s combat vessels. They have most recently been awarded contracts for destroyers, massive amphibious assault ships, and Coast Guard Cutters, but have also been recognized for their manufacturing of cruisers, and nuclear submarines. Among the ships that have been manufactured at Ingalls are some that have gained public notoriety. The USS Cole is one of those ships, as was the USS New York, and each has a story. On the morning of Thursday, October 12, 2000, the USS Cole was the target of a terrorist attack while docked in the Yemeni port of Aden for routine refueling. A bomb ripped open her side, killing 17 American sailors and injuring 39 others. She was brought home to Ingalls, where she was originally manufactured and launched, and they spent sixteen intense months restoring her and returning her to the fleet. The USS New York was also manufactured and launched from Ingalls. The bow was constructed from 71/2 tons of steel secured from the wreckage of the World Trade Center after the attack on September 11, 2001. While every ship carries with it a name of significance, there are those we feel more attached to based on their meaning to us as United States citizens. There are always multiple ships in production at Ingalls at a given time. The Tripoli is one such ship. Once launched, the ship will be named The USS Tripoli. The Tripoli is an America Class Amphibious Assault Ship named for the Battle of Tripoli Harbor. The ship is an improved version of the WASP-Class Amphibious Assault Ship. She has a compliment of 65 officers, 994 enlisted, and 1,687 Marines (plus 184 surge); has a displacement of 45,693 tons; features two marine gas turbine engines and two 5000 hp auxiliary engines; is armed with 2× Rolling Airframe Missile launchers, 2× Evolved Sea Sparrow Missile launchers, 2× 20 mm Phalanx CIWS mounts, and 7× twin .50 BMG machine guns; and can achieve and impressive 22+ knots. The hull design features a “no-right-angles” stealth design that confuses enemy radar regarding the ship’s actual size. The USS Tripoli is designed to house aircraft including the MV-22B Osprey, the F-35B Lightning II, the CH-53K Super Stallion, the UH-1Y Venom, the AH-1Z Viper, and the MH-60S Knighthawk. Once complete, the Tripoli will be a reconfigurable, state-of-the-art facility for air assault and aircraft support. After launch, the ship will go through trials, finalizing integration, fueling, weapons checks, and systems training of actual personnel. The future USS Tripoli is expected to launch in 2017. There are currently ten ships across four classes that are in production at Ingalls, all with uniquely impressive credentials. One of the ways Ingalls is so incredibly successful at building these complex military ships is by maintaining a highly skilled and motivated workforce. To construct these massive ships, Ingalls employs workers to handle work across a wide spectrum. All ships are compartmentalized, and within the thick steel superstructure are systems for HVAC, plumbing, power, mechanics, and communications. The workers not only have to install these systems, they have to install redundant systems so that a ship can take a hit and keep performing if primary systems are knocked out. These super fortified ships, bristling with weapons and steeped in the latest electronics, take years and thousands of skilled man-hours to complete and field test. 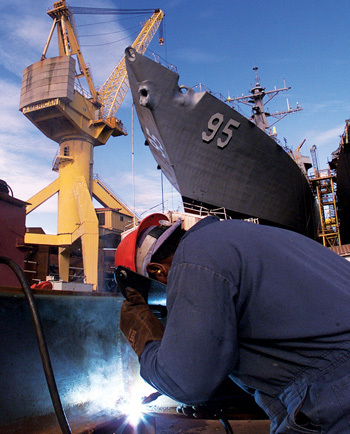 Ingalls is arguably the state’s largest manufacturing employer. The company employs over 12,000 workers in roles ranging from welder to engineer to executive to executive assistant. Every role is important, and every employee is important. A workforce this large does not come on board fully trained and prepared. Ingalls has adopted a strategy of innovation and best practices in developing and maintaining its workforce. This is good for people, community, and, ultimately, business. Not surprising, a great deal of that strategy is centered around the betterment of environment, lifestyle, community involvement, and the individual health and professional development of its employees. Early support at the local level begins with STEM grants awarded at the K-12 levels amounting to $100,000 per year. There is also an effort underway to develop vocational programs with the local high schools. Among the avenues to personal development for individuals to prepare for a career at Ingalls, or to better a career already begun with Ingalls, are thirteen programs at the Maritime Training Academy. These two- to four-year programs use both classroom and learn-by-doing apprenticeships to develop skills in electrical work, pipefitting, welding, painting, and more. Ingalls also provides courses to help bring promising employees up to speed in areas where they may be weak or need improvement. In the community, Ingalls and its employees have been recognized for their work with the Boys & Girls Clubs, Habitat for Humanity, Special Olympics, the Boy Scouts, and more. “We serve as judges in science fairs and on local boards.” On the last “Ingalls Day of Caring,” the volunteers worked on four different projects in Jackson County communities. When Hurricane Katrina, the eleventh storm of the 2005 Atlantic hurricane season, struck with deadly force and devastating impact on the coast, Ingalls stepped up. The company immediately trained their HR department to help perform FEMA functions for employees and local families, and also opened a second camp in New Orleans. Ingalls used the ships in later phases of construction to set up headquarters and lodging for active leadership. During the disaster and months of recovery, Ingalls Shipbuilders served 74,000 meals, administered 4,000 tetanus and flu vaccinations, and assisted with the monumental effort of cleanup and water distribution. Ingalls worked with Western Union to provide net pay in lieu of paychecks since the entire financial infrastructure was wiped out along the coast. Ads were placed in surrounding cities and states providing helplines for employees to call and check in. In addition to coordinating with federal and Red Cross relief and establishing an onsite assistance center, Ingalls Shipbuilding’s parent company at the time, Northrop Grumman, donated $1 million to the Red Cross, $250K to the Gulf Coast United Way organizations, $500K to the Gulf Coast Assistance fund, and replaced backpacks, books, and school supplies for local students. The entire country is wrestling with issues of healthcare and insurance. Ingalls recognized the impact on their employees and decided to help address it on their own. While the company is not able to fix the problems for the country or the system as a whole, the corporation came up with a solution to help their workforce be able to maintain their individual health without a lot of the cost and red tape that many Americans are forced to struggle with when they seek medical attention. A new family health center was planned. Ingalls leased a local medical facility, gutted and rebuilt it, and dedicated it to the health and well-being of its employees and their dependents. Employees now have the additional option to visit the center and benefit from truly affordable and available healthcare. Where employees and their families may have had to wait weeks for family health center visits, they can now visit the new employee health center quickly and easily, with no charge for wellness visits and a standard $15 co-pay for regular visits, labs, x-rays, and other services. A 30-day generic prescription can be purchased for only $3, with a 90-day generic prescription only costing $6. Securing Our Nation. Securing a Future. Competition is pervasive, even for large-scale manufacturers contributing to national security. Ingalls Shipbuilding has secured $60 million, $20 million from the state and a matching $40 million from Huntington Ingalls Industries, to upgrade their facilities so that they are able to aggressively compete for future contracts. Included in the upgrades are a new dry dock facility and a covering of the expansive outdoor area used for overflow production. Covering the outdoor manufacturing space ensures that production does not stop for weather, which greatly impacts delivery schedules, work shifts, and overall efficiency.